Peter the Great's portrait by Paul Delaroche. 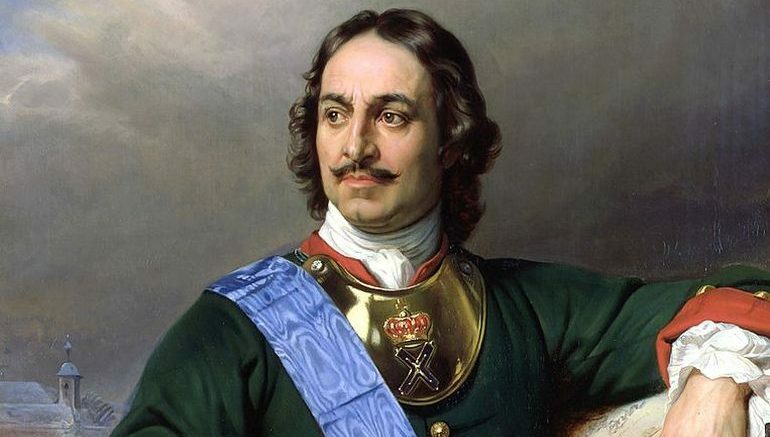 Pyotr Velikiy or Peter the Great is usually credited with transforming the Russian Tsardom into a major European power that was labelled as the Russian Empire, circa early 18th century. Concurrently the ‘enlightened’ Tsar also led a cultural revolution of sorts that sought to replace the traditionalist social and political systems (some based on medieval ideals) of Russia with more modernized and scientific principles. And as with numerous episodes of history, some of the ‘reforms’ took a bizarre turn, with the prime example relating to the beard tax. This ‘special’ tax was levied by Tsar Peter I on 5th September, 1698 – thereby simply entailing the direct taxation of facial hair in Russia. The ‘hair raising’ question naturally arises – how did this oddball scope work? Well as New Historian explained, anyone person with a penchant for keeping his beard had to directly pay the government. In fact, after his monetary deposit was made, the related department would actually provide the man with a tiny copper token (pictured below), which simply stated that the said person has fulfilled his beard tax obligation. Interestingly, in line with the ideals of enlightenment, the tax bar was different for various social classes. For example, while a beggar only had to pay two kopecks for keeping his beard, the wealthy nobles had to pay over hundred rubles for their fair share of facial hair. 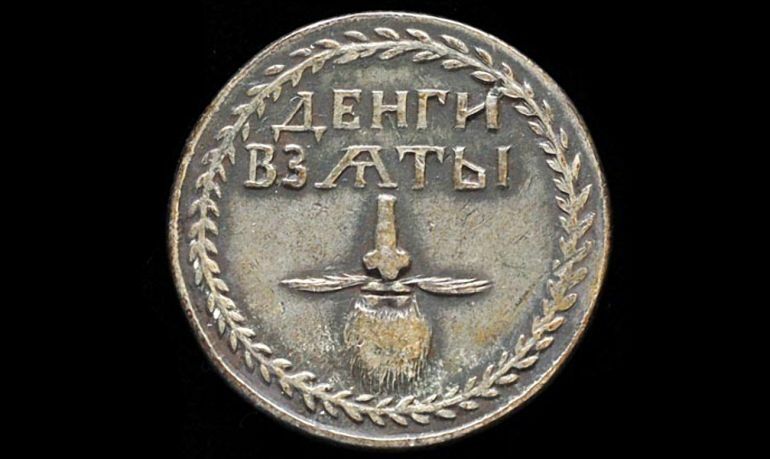 A beard token, received for paying the Russian beard tax. Suffice it to say, the Russian emperor was not an ardent aficionado of boisterous beards. During one particular incident, when Peter triumphantly returned from his impressionable European tour in 1698, a grand reception was held in his honor. The attendance was marked by eminent guests including his commander of the army and other nobles and diplomats from around the nation. But after passing around and embracing his friends and confidants, Peter produced a pair of scissors and went on to personally shave their beards. The crowd watched in stunned silence as the emperor made his way from one guest to another, while the nobles restrained themselves on account of the Tsar’s political stature (possibly complemented by Peter’s imposing physical stature, with many accounts mentioning how the emperor rose to a height of 6 ft 8 inches). Things took such a drastic turn because Peter was possibly influenced by the fashionable trends in Western Europe that often espoused clean-shaven faces. In fact, the Tsar was so intent on his ‘hairless’ crusade that initially the Russian police were given orders to forcibly shave those who failed to comply, with the exception of clergy members and peasants. And in late 1698, the beard tax was introduced merely an extension of this bizarre law that sought to make monetary benefits from what Peter viewed as an anachronistic fashion sense. This government sanctioned legislation remained till 1772, 47 years after the Tsar had died. 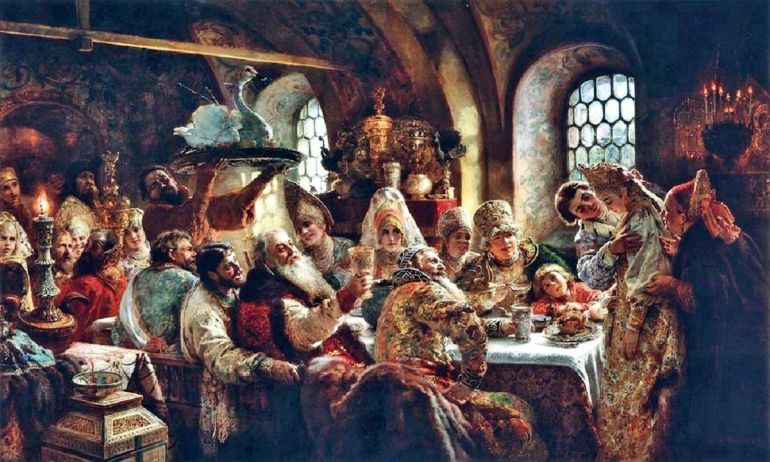 A Boyar Wedding Feast in the 17th Century. Painting by Konstantin Makovsky. Shaving the beard is a sin the blood of all martyrs will not wash away. It would mean blemishing the image of man as God created him. Lastly and interestingly, there are also numerous claims that yet another monarch (from another realm) beat Peter I when it came to the eccentric scope of a beard tax. We are talking about one Henry VIII, and how he initiated his own brand of beard tax (possibly in 1535 AD), despite boasting a fine mane of facial hair himself. Now as opposed to the Russian scenario, this law was possibly more selective in nature with the amount collected by the monarch reflecting the beard-grower’s standing in society – thereby equating facial hair with a status symbol. However it should be noted that Henry VIII’s beard law might just be apocryphal, with no known contemporary document from 16th century pointing to the existence of any such peculiar statute.